We Found a Fig Tree! Last week, I was in search of a fig tree for our yard. Thanks to some great suggestions and insight (thanks especially David M., Chelsea B., Shannon D., Natalie T., Dave E., Susanne H., Tiffany M., Miriam P., and Carla C.! ), we found a little Celeste Fig Tree at Barton Springs Nursery. I wanted the Alma Fig Tree just because of the name (“alma” means soul or spirit in Spanish), but we opted for the Celeste because it is supposed to produce more fruit earlier, and also be more tolerant to cold. I also liked the fact that the particular fig tree we picked out already has figs growing on it . . . in other words, even if I totally fail in my fig-growing venture, I can still say we had one crop :) See them in the picture below? Quite a bounty! Jack wanted to help me plant the tree, so he brought his shovel. And his jackhammer, which was super useful. My mom (Mrs. Green Thumb) said to water it every day. She said it needs a lot of water because it is such a young tree with no root system yet, and also because of the extreme heat right now. So I’ve been watering it every few days (hashtag lazy, hashtag forgetful). In the meantime, I hope John will bring some figs home from the Farmer’s Market today. 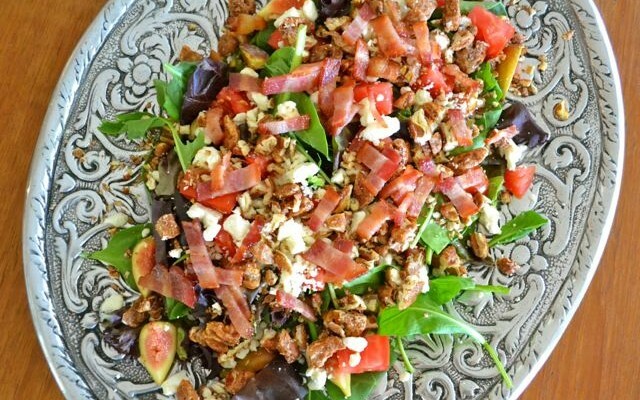 Then we can make a Fig Bacon Salad again (recipe here). Which raises a philosophical question: If there is more bacon than greens in your salad, is it still a salad? . . . I’m going to keep telling myself it is.